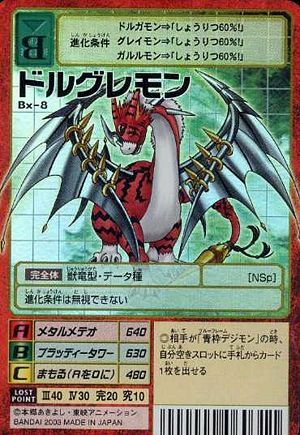 Battle Type Evolution Requirements DORUgamon + Winning Percentage: 60%! Greymon + Winning Percentage: 60%! ◎When the opponent is a blue frame Digimon, you may send one card from your hand into one of your empty slots. This page was last modified on 21 July 2016, at 00:23.